The photographic archives in the New York Public Library is the surprising repository for hundreds of historic photographs of Palestine. Some of the pictures date back to the 1850s and 1860s. We provide here a selection of some of the amazing photographs. Future postings will focus on particular pictures and the photographers. 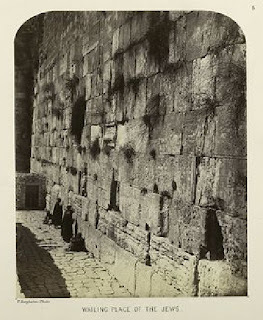 Survey photo of the "Wailing Place of the Jews"
York Public Library) See here for similar photos. Many of the photos were taken from the British Ordnance Survey of Jerusalem of 1865 led by Captain Charles W. Wilson. 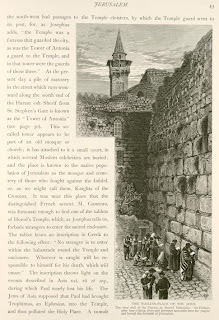 He and Captain Charles Warren led extensive archaeological excavations near the Temple Mount ("Wilson's Arch" and "Warren's Shaft" are well-known to visitors to Jerusalem). Warren would go on to become the head of London's police during the "Jack the Ripper" murder spree. We thank staffers at the Library of Congress who steered us to the Survey and officials at the New York Public Library who granted permission to publish the photos. See here for similar photos. The 1865 Survey contained measurements, maps and descriptions of the city of Jerusalem which was almost all contained within the Old City walls. The explorers sank shafts along the Old City walls, explored underground tunnels, cisterns and caverns, and recorded their findings. 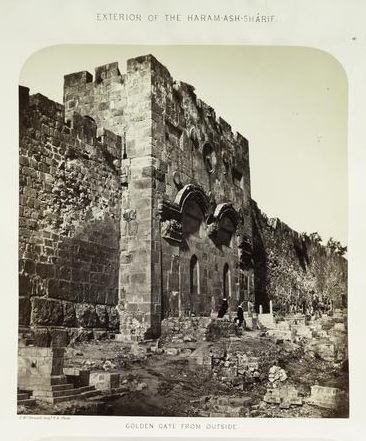 In 1871,Wilson and Warren published The Recovery of Jerusalem, a Narrative of Exploration and Discovery in the City and the Holy Land, a memoir of their experiences in Jerusalem, including dealing with rapacious Ottoman officials, impassible roads, and local workers. Interestingly, the Wilson-Warren book did not include photographs; it was illustrated with woodcuts such as this one possibly copied from the Bergheim photo above. And note how similar the woodcut is to the one illustrating William Seward's travelogue. Seward was Abraham Lincoln's Secretary of State who visited the Holy Land in 1859 and 1871. Both books, published in 1871, describe Jewish prayer at the Western Wall as restricted to Friday evening.